There is no evidence currently available to inform how to best prescribe local anaesthetics for abdominal wall blocks, TAP, rectus sheath or surgically placed catheters. In light of TAP and rectus sheath techniques being a field block, many institutions prescribe high volume bolus top-ups rather than a continuous infusion (1-8). A typical prescription described in the literature for continuous analgesia is 20mL of 0.2% ropivacaine Q4hourly or 0.25% bupivacaine Q6hourly down each catheter. For rectus sheath catheters there are descriptions of continuous infusions in the literature, with a case series using 4mL/hour/catheter of 0.125% ropivacaine and 0.15% ropivacaine with good effect and nil complication (9). Infusions of 0.1% bupivacaine at 21mL/hour/catheter in 10 patients has also been described without complication (10). Bolus and continuous infusions are also described for TAP catheters. In two randomized controlled trials from the same institution by Niraj et al, it is noted that a bolus regimen was used in one and a continuous infusion in another, with favourable results in both and no rationale for the choice in either (8, 11). Any advantage of bolus over continuous infusion, or the optimal volume of injectate for each block technique is yet to be defined in the literature. While the possibility of toxicity is recognized, especially in higher risk groups, there are significant limitations in assessing this meaningfully in current literature (12). The doses recommend in the protocol may need to be reduced in patients at increased risk of local anaesthetic toxicity, including those with a reduced lean body mass, significant liver, kidney or cardiac dysfunction, hypoalbuminaemia, or acidosis due to a reduction in metabolism or the volume of distribution. Those with hypercarbia will have a reduced seizure threshold and those with acidosis, hypoxia, a known cardiac conduction abnormality or poor cardiac function are more sensitive to the central nervous or cardiac complications of toxicity in the event they do occur (13). While recognizing the risk, there are no reports of serious complication from local anaesthetic toxicity with TAP block, RSB or RSC in the literature. This is consistent with the evidence that the absorption kinetic profile for ropivacaine after TAP or rectus sheath block is slower than other compartment blocks, with deposition of local anaesthetic into a relatively avascular fascial plane (7). It was noted in the study of ropivacaine plasma concentrations following lumbar epidural by Sandler et al, one patient was excluded from the evaluation due to presumed intravascular injection with a failed epidural block. The patient received a 125mg bolus down the epidural, with symptoms of a metallic taste and “numbness of the head” approximately 6 minutes later, with a maximum plasma concentration of 2.82μg/ml at 8 minutes (18). In the study by Griffiths et al, 28 adult females received bilateral ultrasound guided lateral TAP blocks, with 20mL injection bilaterally and a total of 3mg/kg of ropivacaine. While the mean plasma doses are similar to that achieved with rectus sheath blocks and other regional techniques, the peak plasma concentration measured in one individual was as high as 4μg/ml with the unbound concentration being as high as 0.25μg/ml. 10 patients exceeded the potentially toxic threshold of 0.15μg/ml (15). While the clinically relevant conclusions that can be made are limited, this study does caution that a total dose of 3mg/kg for a TAP technique may be excessive in some patients. It is interesting to note the significant difference in results between the two TAP trials by Griffiths et al and Borglum et al (12, 15), despite the similarities in block technique. The ability to make meaningful conclusions is obviously limited by the small sample sizes and the differences in gender and weight adjusted dose of local anaesthetic between each study population. The differences in technique to analyse the plasma concentration of ropivacaine with gas and liquid chromatography is also of uncertain significance. The other key difference is the correlation between the use of sedation and general anaesthesia in the study and much higher plasma levels of ropivacaine, with previous authors noting similar findings in animal studies (21). While the relevance of the later point is yet to be defined in the literature, it does serve to highlight the caution needed when generalising studies in healthy volunteers not having surgery, to the clinical workplace. In a study of 39 ASA 1-2 adults undergoing elective midline lower abdominal incisions, local anaesthetic plasma concentrations were assessed up to three hours after 20mL boluses (i.e. 10ml bilaterally) of 0.75%, 0.5% and 0.25% ropivacaine. The mean arterial plasma concentration even with use of 0.75% ropivacaine is much lower than the plasma levels found after injection with other regional anaesthetic techniques as shown in Figure 20. The highest individual plasma concentration was 2.88μg/ml 45minutes after RSB with 0.75% ropivacaine (7). In the only study examining plasma concentrations following use of a local anaesthetic infusion, no clinical symptoms of toxicity were observed. In this study of twenty adults post-liver resection, the ropivacaine plasma concentrations continued to rise and failed to peak in most patients until termination of the infusion at 68 hours, but interestingly did not correlate with indices of a subject’s pre- or post-operative liver function. This lead the authors to recommend limiting the infusion of local anaesthetic to no longer than 48 hours post liver surgery, with no identifiable predictors of risk (20). 1. Sandeman DJ, Dilley AV. Ultrasound-guided rectus sheath block and catheter placement. ANZ journal of surgery. 2008;78(7):621-3. 2. Webster K. Ultrasound guided rectus sheath block – analgesia for abdominal surgery. Update in Anaesthesia. 2010;26:12-7. 4. Khorgami Z, Shoar S, Hosseini Araghi N, Mollahosseini F, Nasiri S, Ghaffari MH, et al. Randomized clinical trial of subcutaneous versus interfascial bupivacaine for pain control after midline laparotomy. The British journal of surgery. 2013;100(6):743-8. 5. Godden AR, Marshall MJ, Grice AS, Daniels IR. Ultrasonography guided rectus sheath catheters versus epidural analgesia for open colorectal cancer surgery in a single centre. Annals of the Royal College of Surgeons of England. 2013;95(8):591-4. 6. Padmanabhan J, Rohatgi A, Niaz A, Chojnowska E, Baig K, Woods WG. Does rectus sheath infusion of bupivacaine reduce postoperative opioid requirement? Annals of the Royal College of Surgeons of England. 2007;89(3):229-32. 7. Wada M, Kitayama M, Hashimoto H, Kudo T, Kudo M, Takada N, et al. Brief reports: plasma ropivacaine concentrations after ultrasound-guided rectus sheath block in patients undergoing lower abdominal surgery. Anesthesia and analgesia. 2012;114(1):230-2. 8. Niraj G, Kelkar A, Jeyapalan I, Graff-Baker P, Williams O, Darbar A, et al. Comparison of analgesic efficacy of subcostal transversus abdominis plane blocks with epidural analgesia following upper abdominal surgery. Anaesthesia. 2011;66(6):465-71. 9. Shido A, Imamachi N, Doi K, Sakura S, Saito Y. Continuous local anesthetic infusion through ultrasound-guided rectus sheath catheters. Canadian journal of anaesthesia = Journal canadien d'anesthesie. 2010;57(11):1046-7. 10. Watson D FI, Dennison AR, Cole J, Watson A, McAllister S. Postoperative analgesia by infusion of local anaesthetic into the rectus sheath. 1991. 1991;67:656P. 11. Niraj G, Kelkar A, Hart E, Horst C, Malik D, Yeow C, et al. Comparison of analgesic efficacy of four-quadrant transversus abdominis plane (TAP) block and continuous posterior TAP analgesia with epidural analgesia in patients undergoing laparoscopic colorectal surgery: an open-label, randomised, non-inferiority trial. Anaesthesia. 2014;69(4):348-55. 12. Borglum J, Jensen K, Christensen AF, Hoegberg LC, Johansen SS, Lonnqvist PA, et al. Distribution patterns, dermatomal anesthesia, and ropivacaine serum concentrations after bilateral dual transversus abdominis plane block. Regional anesthesia and pain medicine. 2012;37(3):294-301. 13. Rajan N. Management of severe local anaesthetic toxicity. Update in Anaesthesia. 2009;25(2):76-9. 14. Knudsen K, Beckman Suurkula M, Blomberg S, Sjovall J, Edvardsson N. Central nervous and cardiovascular effects of i.v. infusions of ropivacaine, bupivacaine and placebo in volunteers. British journal of anaesthesia. 1997;78(5):507-14. 15. Griffiths JD, Barron FA, Grant S, Bjorksten AR, Hebbard P, Royse CF. Plasma ropivacaine concentrations after ultrasound-guided transversus abdominis plane block. British journal of anaesthesia. 2010;105(6):853-6. 16. Costello TG, Cormack JR, Hoy C, Wyss A, Braniff V, Martin K, et al. Plasma ropivacaine levels following scalp block for awake craniotomy. Journal of neurosurgical anesthesiology. 2004;16(2):147-50. 17. Rettig HC, Lerou JG, Gielen MJ, Boersma E, Burm AG. 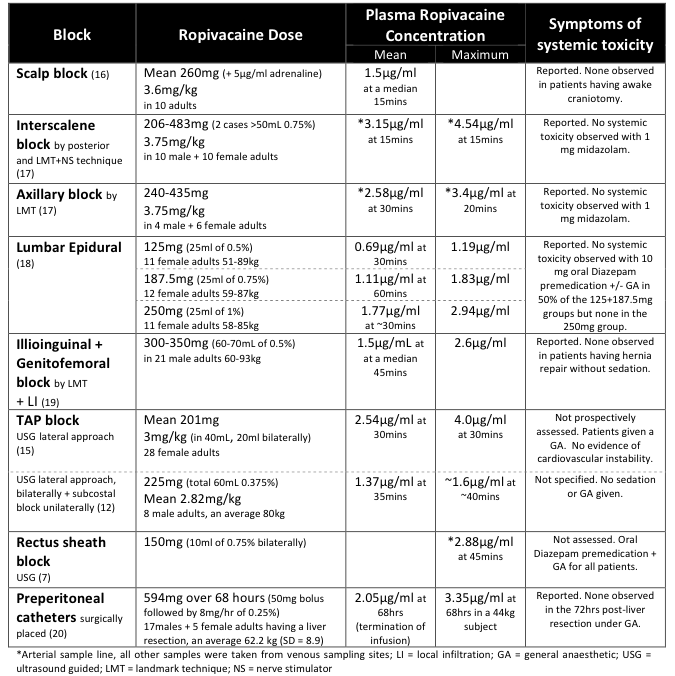 The pharmacokinetics of ropivacaine after four different techniques of brachial plexus blockade. Anaesthesia. 2007;62(10):1008-14. 18. Sandler AN, Arlander E, Finucane BT, Taddio A, Chan V, Milner A, et al. 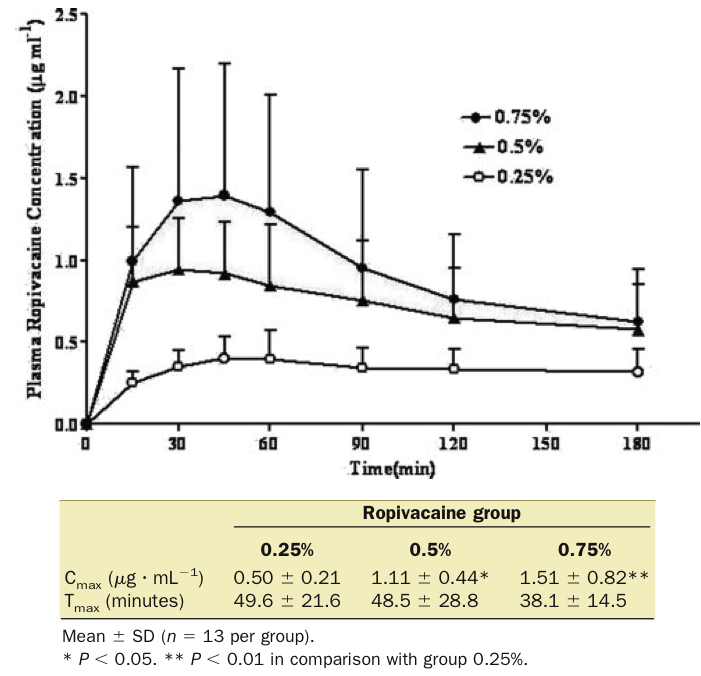 Pharmacokinetics of three doses of epidural ropivacaine during hysterectomy and comparison with bupivacaine. Canadian journal of anaesthesia = Journal canadien d'anesthesie. 1998;45(9):843-9. 19. Wulf H, Behnke H, Vogel I, Schroder J. Clinical usefulness, safety, and plasma concentration of ropivacaine 0.5% for inguinal hernia repair in regional anesthesia. Regional anesthesia and pain medicine. 2001;26(4):348-51. 20. Chan SK, Lai PB, Li PT, Wong J, Karmakar MK, Lee KF, et al. The analgesic efficacy of continuous wound instillation with ropivacaine after open hepatic surgery. Anaesthesia. 2010;65(12):1180-6. 21. Copeland SE, Ladd LA, Gu XQ, Mather LE. The effects of general anesthesia on whole body and regional pharmacokinetics of local anesthetics at toxic doses. Anesthesia and analgesia. 2008;106(5):1440-9, table of contents.